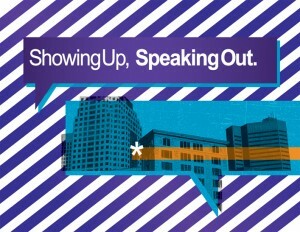 Showing Up, Speaking Out sought to explore the extent to which artists can motivate and facilitate civic participation by connecting local, national, and international artists with local communities through the collaborative production of ephemeral artworks deployed in public spaces throughout Winnipeg. A goal of this project was to enhance relationships between artists and diverse communities through the formation of a socially resonant context that will highlight the creative, critical work of artists while proving unique opportunities for community members to collaborate with them in manners well poised to increase confidence in recapturing the public sphere as a place for thoughtful idea exchange. The presentation site for this project served as a staging ground where people collaborated to determine projects, plan the delivery of their interventions, and make props as necessary. The venue was, simultaneously, a site for exhibiting ephemera related to each action (i.e. used props, photographs, digital video, messages to other participants). It was also a destination for discussing the potential impact of the actions and reflecting on what participants might have gained from their involvement. All activities were supported by a blog/online discussion forum. Featured Artists: Inge Hoonte (Netherlands/USA) on recreation, Tomas Jonsson (Calgary) on housing and poverty, Deborah Kelly (Australia) on diversity, Kristin Nelson (Winnipeg) on accessibility, and Stop Violence Against Aboriginal Women Action Group including collaborating artist Leah Decter (Winnipeg). This project was made possible thanks to partnerships with many local organizations: aceartinc., Art City, Institute for Women’s and Gender Studies at the University of Winnipeg, Mentoring Artists for Women’s Art, newinnipeg.net, RAW: Gallery of Architecture and Design, Social Planning Council of Winnipeg, The University of Winnipeg’s Students’ Association, Urban Shaman: Contemporary Aboriginal Art, and Video Pool Media Arts Centre. Generous financial support for this project was made available by the Canada Council for the Arts and the Winnipeg Arts Council.